Mobile social gaming company Pongr has a way for cell phone users to turn the tables on marketers and make some money on their advertising. Its advertising challenge asks cell phone shutterbugs to shoot pictures of any advertising they see and email them to Pongr. At the end of the contest Thursday, the ad shooters with the most "Pongr bucks" win prizes. The top prize is a $100 pre-paid American Express gift card. Pongr capitalizes on the affection that some consumers have for the brands they use, as well as the desire by brand marketers to connect with their customers, particularly their most loyal customers. That's because those customers tend to act as good-will ambassadors for the brands and often encourage others to use them. Pongr combines several popular online technologies. There's an element of photo sharing, which has been popularized by sites like Fickr. There's a social gaming component along the lines of Farmville. And, of course, there's the tie-in to social networking and microblogging through Facebook and Twitter. Pongr's image-recognition software is now used to identify the brand in a photo submitted to the site. That information is used to trigger a response to the person who submitted the photo. That response may be additional information about the product. It may be a special offer from the brand or an entry to a contest. And it always includes Pongr bucks. Pongr awards one Pongr buck for each picture submitted to the site. 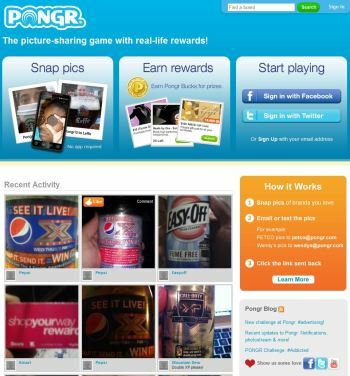 Additional bucks can be earned by sharing a photo on a social network, as well as from inviting friends to join Pongr. In addition to the $100 grand prize, Pongr is offering a second place prize of $50; third place, a $15 Best Buy card; and for places four to eight, a $5 Starbucks card. The contest is open to anyone with a mobile phone that has a camera and an email address. Participation is very simple. Shoot an ad you see. Then e-mail it to Pongr using the product name as the addressee in the e-mail address. So if you see a Coke ad, you'd e-mail your photo to coke@pongr.com. The subject line for all contest entries must contain #advertising, the company explained in a statement. This version of Pongr, based in Boston, has been in business about a year. When the company was founded in 2008, the idea was to use its image-recognition technology as the basis for a price comparison site. As the price comparison space became more crowded, its development team began to look at a new angle for its technology.